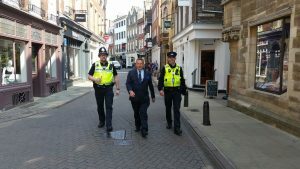 CAMBRIDGESHIRE’s new Police & Crime Commissioner, Jason Ablewhite, spent the morning of his first day in office patrolling the streets of Cambridge. Following a tour of Parkside Police Station, Jason went on patrol with PC Ben Shayle and PCSO Tony Marriott, getting a taste of front line policing and meeting the public. Following this he travelled to police headquarters in Huntingdon for his first official meeting as Police and Crime Commissioner with Chief Constable, Alec Wood, and other members of the Constabulary’s senior management team. Jason was elected Cambridgeshire’s new Police and Crime Commissioner last week and today (12th May) is his first official day in post. He takes over from previous Police and Crime Commissioner Sir Graham Bright who decided not to stand for re-election. Jason is committed to protecting frontline policing services and putting victims of crime first. Jason also pledges to reduce violent, drink and drug related crimes, and focus on domestic violence. With a career background in sales and senior management in the food sector, Jason retired last year to concentrate on local politics. He has a strong sense of public service, having served as a District Councillor in St Ives for 16 years, with the last five as Leader of Huntingdonshire District Council. Jason also chaired the East of England Local Government Association and Executive Board member of the National Local Government Association, providing him with considerable experience at local, regional and national levels. Jason lives in St Ives with his wife Annette and two sons. The Chief Constable, Alec Wood, welcomed Jason and spoke about the importance of the role of Police and Crime Commissioner in ensuring the voice of the public is heard. Chief Constable Alec Wood said: “I would like to welcome Jason Ablewhite to the role of Police and Crime Commissioner and look forward to working with him to help keep the people of Cambridgeshire and Peterborough safe. “The role of PCC is hugely important in helping to link the public with the police and holding the force to account for the service it provides.